The WR1000 upgrades your network to next generation Wi-Fi. With combined wireless speeds of up to 1200Mbps, the device provides better speeds and coverage. You can run multiple bandwidth intensive applications in a large home or office. Simple tasks like web browsing can be handled by the 2.4GHz band while bandwidth intensive tasks like online gaming or HD video streaming can be processed by the 5GHz band at the same time. 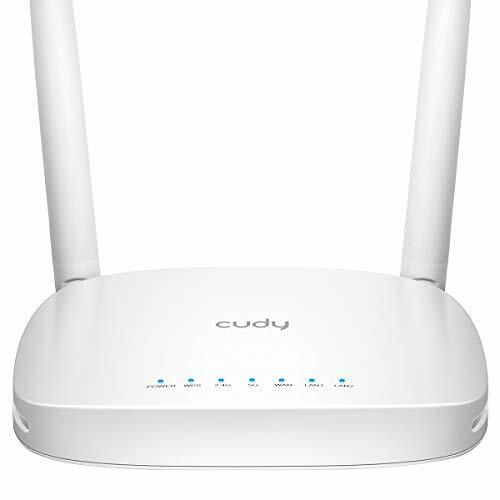 Cudy WR1000 comes with the latest wireless standard - 802.11ac. This advanced Wi-Fi technology is designed for high-traffic online activities and can help to run applications at triple the speed of the previous 802.11n standard. Thanks to dual Wi-Fi bands, you can run more of your devices at the same time without interruption. The strong 2.4GHz 300Mbps Wi-Fi is perfect for sending emails, browsing the web, and listening to music. The crystal 5GHz Wi-Fi band reaches 867Mbps so you can game online and stream in HD simultaneously. 2*5dBi High gain antennas boost the reception and sensitivity of the router to create stronger connections over greater distances. This allows the router to enhance wireless range and coverage, providing powerful penetration through walls and floors. Maintain high security across your network to help ensure your privacy is safe while online. Whether it's preventing phishing or just limiting access for kids & guests. AC 1200Mbps Wi-Fi SPEED. Upgrades your network to next generation Wi-Fi. With combined wireless speeds of up to 1200Mbps, Cudy WR1000 WiFi router provides high speed and long range WiFi for Smart Home & Alexa Devices. HIGH PERFORMANCE. 2x5dBi High gain antennas boost sensitivity of the WiFi router, create connections over greater distances, providing powerful penetration through walls. CONCURRENT DUAL BAND Wi-Fi. 2.4GHz provides extremely long range, 5GHz reaches 867Mbps, ideal for gaming and 4K streaming. Simple tasks like web browsing can be handled by the 2.4GHz band, while bandwidth intensive tasks like online gaming or HD video streaming can be processed by the 5GHz band at the same time. HOME SECURITY. WR1000 WiFi Router's firewall maintain high security across your network to help ensure your privacy is safe while online. Parental control function helps you to prevent phishing or just limit access for kids & guests. 2-IN-1 ROUTER /RANGE EXTENDER. WR1000 Provides maximum flexibility of use. Even if you are upgrade network to more higher speed, WR1000 could also be a part of your network，you can setup it as a range extender to extend your Wi-Fi coverage. 3 years warranty. Manufacturer: Shenzhen Cudy Technology Co., Ltd. Publisher: Shenzhen Cudy Technology Co., Ltd. Studio: Shenzhen Cudy Technology Co., Ltd. If you have any questions about this product by Cudy, contact us by completing and submitting the form below. If you are looking for a specif part number, please include it with your message.